In Greater, Pastor Steven Furtick challenged us to dream bigger, start smaller, and ignite God’s vision for our lives. 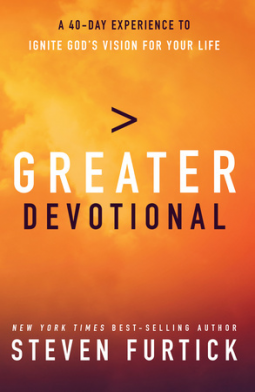 In this devotional designed for daily guidance, you’ll begin your journey toward the greater life God wants for you. Over the next forty days of teaching, scripture readings, and prayer, your life will change. You’ll find the confidence to believe that nothing is impossible with God, the clarity to see what He’s calling you toward, and the courage to take your next step. Dream bigger. Start smaller. Ignite God’s vision for your life.